I’m in your home. Unfortunately, you aren’t there, sitting by my side. In your home, in my memories, within my heart. Your familiar smell, your booming… southern voice. At times you seem so close, your soul… closely intertwined with mine. Right now… This very minute… Your Heavenly residence seems too far away. You were a regular face… A constant redeeming presence… God to a little girl’s soul. A positive role model to my inner child. I told you of my love. In my wedding pictures… Your presence, at my side. You were there… You surely cared. I remember… I can’t forget. Five months ago, God called you home. As I held your hand… Sang hymns softly in your ear… You slipped away. Why did it take your passing… For me to see. To truly understand the depth of our bond. To fully comprehend the impact your life had on mine. So many hugs… Left unhugged. So many conversations… Left unsaid. I long for another hour… Another day. All that’s left are your worldly possessions, the impact you had on my life. The numerous impressions, you made on those left behind. Your heart always tender, giving, and gentle. Your hugs were strong, safe, and comforting. Your voice so deep, reassuring, and steady. 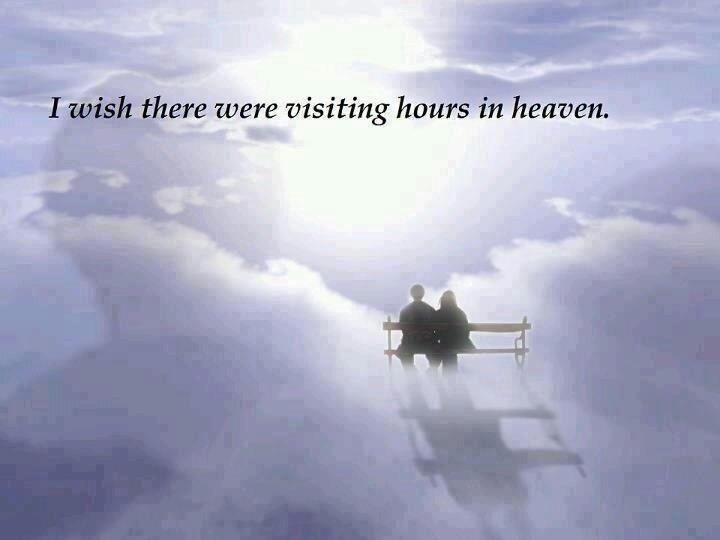 I wish there were visiting hours in Heaven! I’ve never heard it articulated that way, but I, too, would like visiting hours in Heaven…I’d tell my Mom that I’m sorry her last week on earth was so hard…even though I know her first second in Heaven with Jesus made her forget all that! Amen! I miss my sweet uncle everyday! I’m sure you miss your mother as well! Yes, it’s so final…but sometimes I forget she’s gone…and I wouldn’t mind getting to visit with her…then she could tell me all about Heaven!! My parents are not dead but I constantly think of what things would be when they are gone. I start thinking to myself ” I should of got to know them better. I should of asked about they’re brothers and sisters names. I should of asked them about memories they most love when they were young”. I’m thankful I thought like this soon while my parents are still alive. So now I ask them questions about them and their past. Like today, my dad told me about pastorelas that people made in Acuna, Coahuila from where he’s from. How they went from house to house doing pastorelas during the Christmas season. Pastorelas are plays about the birth of Christ and the shepherds and the devil hanging around. So if your parents or loveones are still alive today, starting today ask thing you want to remember them for. Ask about their history and how their parents raised them. Ask about their traditions and cultures and how they are different today. Just get to know them and their history before they depart to the other world. Thank you Crystal for bringing this up and your blog. Thank you for this post. Much apreciated from me. Thank you for sharing! I’m glad you were blessed! God bless! I love how you titled this. I also wish for a visiting time to see my 27 year old son. Your uncle sounds like a wonderful person. I am sorry your recent loss. I’m sure you miss your son very much :(. Yes, my uncle was amazing! I certainly do, but because of God’s mercy through Jesus we are given the opportunity to be with them again! What a marvelous God we serve! That in itself has made my loss bearable. So comforting! Thankful for,the hope we have in Christ!